St. Joseph's Hospital is a ninety-seven bed care home facility within Bon Secours Care Village. The hospital is a purpose built facility, built in 2002, and extensively refurbished in 2018, with a high standard of residential living space on ground floor level and surrounded by mature trees and gardens in a peaceful, rural setting. Our muti-disciplinary team offers an holistic approach to care, ensuring each resident's personal, medical, spiritual, psychological and social needs are properly addressed. The decision to move into a care facility, especially long term can be a difficult decision and we believe in offering as much information, support and time as required for each individual. We encourage visits to our home, giving the opportunity to sample the atmosphere, meet residents and staff and gain a better understanding of what the hospital can offer. All nursing care is delivered at ground floor level divided into four individual units, with its own Nurse & Health Care team dedicated to each unit. Each unit is self-contained with a kitchenette and recreational lounge with direct access to secure courtyard gardens. All bedrooms are very spacious and incorporate a sink, shower and toilet and meet the requirements/ regulations. 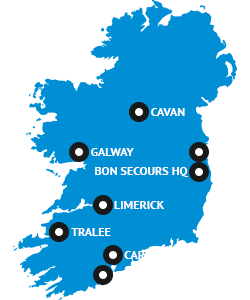 To find out more please call us on 021 4541566, email us at carevillage@bonsecours.ie or write to us at Bon Secours Care Village, Mount Desert, Lee Road, Cork.